Slot Die and PUR Hot Melt Applicators | ITW Dynatec is a global supplier of adhesive applicators and solutions for various industries. ITW Dynatec's PUR hot melt applicator and slot applicator technology provides industry-leading solutions for demanding manufacturing requirements including; precision metering, wide-web application, continuous & intermittent, and curtain coating technology. Custom patterns in minutes with easy-cut shims provide exception flexibility. Standard widths of 100mm, 200mm, 300mm, 400mm, 500mm and 600mm. Capable of providing individual metered flow output to each module. 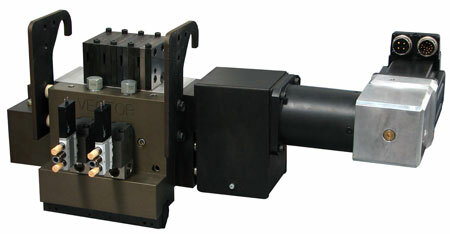 Slot applicator shares a common pump base with the spray and metering station.